An interview with Antti Lehtelä, Contract Manager​ at ABB Marine & Ports. It seems like just about every cruise ship entering service these days has pod propulsion rather than traditional propeller shafts. Cruise line executives and ship's officers trumpet the increased maneuverability and efficiency of pod systems. However, most cruise ship passengers have only a vague understanding about pods. Therefore, we asked ABB, the maker of the Azipod® propulsion system, to explain their system. * Antti Lehtelä, Contract Manager at ABB Marine & Ports, provide the answers. How does an Azipod® podded propulsion system work? ABB’s Azipod® propulsion is a gearless steerable propulsion system which incorporates an electric drive motor contained in a submerged pod outside the ship’s hull, where most conventional solutions locate the drive motor inside the hull. The podded propulsion system’s motor is linked directly to a fixed pitch type propeller, controlling the propeller’s speed. Electric power for the motor is conducted through slip rings that allow the Azipod® unit to rotate through 360 degrees around the vertical axis, allowing it to supply thrust in any direction, which results in far greater maneuverability for the ship than is the case for shaftline solutions. A vessel fitted with an Azipod® propulsion system does not require rudders, long shaftlines or transverse thrusters and thereby permits reduced hull resistance. Azipod® units are also proven to achieve significantly better fuel efficiency than conventional propulsion systems. Other benefits include improved safety and redundancy, enhanced comfort levels onboard, easier installation in shipyards and improved operating characteristics in heavy ice conditions. What is the history of the Azipod® propulsion system? When was the concept invented? The development of the concept by ABB was a response to demand from the shipping industry for vessels that achieved greater maneuverability and fuel efficiency, that could visit smaller and harder to access ports and provided more space onboard for passengers and cargo. In 1990 the Finnish Board of Navigation vessel, Selli, was fitted with the first Azipod® propulsion system following its conversion by ABB. This was the starting point for a new generation of azimuthing propulsion systems, which over the next 28 years have been used to power a wide range of vessel types. Around 5 years after the successful trials on Selli, the first order for a cruise ship was received from Carnival Cruise Lines, for its Fantasy class newbuildings. [i.e. Carnival Paradise] In 2018, ABB passed the 100-cruise ship milestone with an order to supply the French company Ponant’s latest polar expedition cruise ship. Over the past 25 years the technology has also been used to power offshore vessels, icebreakers, workboats, ro-ro ships, LNG carriers, dry cargo ships, tankers and heavy lift ships, among others. Between them these vessels have over 15 million operational hours with the Azipod® system. It is our understanding that podded propulsion has advanced over the last decade. Is that so and if so give some examples of how it has advanced? ABB has continued to invest heavily in research and development and this has led to continued improvements in Azipod® performance, efficiency and reliability. The most recent new version of the technology, Azipod® D, was launched in 2015, and the first vessel fitted with this system - an 8000kW rescue tug - was delivered to Guangzhou Salvage Bureau in December 2017. Suitable for a wide range of vessel types, Azipod® D is available across a power range from 1.5MW to 7.5MW. Advanced thruster technology enables installed power savings up to 25%, reduced maintenance and less fuel consumption and emissions. The Azipod® D range demonstrates ABB’s continuing drive to raise efficiency and cut lifetime running costs. More can now be achieved with less and the scalable Azipod® D is suitable for a broader range of applications than earlier generation units. Other recent developments from ABB include Azipod® DO, a second-generation compact size pod series, also covering a power range from 1.5 MW to 7.5 MW. Azipod® DO is the most efficient azimuthing propulsor in its power range and has excellent course-keeping characteristics. Based on its gearless construction and high performance, Azipod® DO provides cost efficient, reliable and energy saving operations for cruise, ferry, offshore and special vessels. The high performance of the thruster is achieved by a unique hybrid cooling of the propulsion motor combining a direct cooling to the surrounding sea water and an active air cooling system. Introduced within the past five years, Azipod® XO is a propulsion solution for high power open water applications. It is available up to 22 MW unit power and it is considered an ideal choice for passenger vessels including both ferries and cruise vessels. Azipod® XO brings with it improved energy efficiency, excellent maneuverability and improved passenger comfort. What other types of ships besides cruise ships use Azipod® propulsion? ABB’s Azipod® propulsion technology has been selected to power more than 20 different ship types. Within the offshore segment it has been used for drilling rigs, offshore supply vessels, accommodation vessels and pipelayers. Excellent Dynamic Positioning (DP) operation is one of the reasons for the concept’s popularity in this segment. Aside from cruise ships, Azipod® propulsion has been supplied to passenger ferries and yachts, and a variety of workboats - including tugs, oceanic research ships and icebreakers. Indeed, Azipod® propulsion has proved to be the technology of choice for more than 30 ice-going vessels, including shuttle tankers, LNG carriers and container ships operating in Arctic waters. What are the advantages of the ABB pod system? The benefits of the Azipod® propulsion systems are as relevant today as they were 25 years ago. 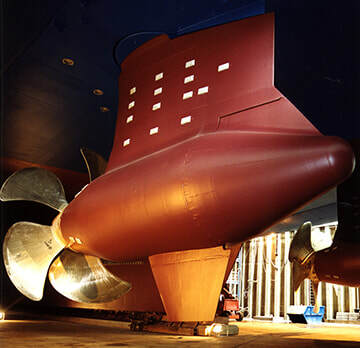 Azipod® units offer high levels of hydrodynamic efficiency, superior maneuverability, space savings, low noise and vibration, god levels of maintainability and ease of installation in the shipbuilding and conversion process. Fuel consumption savings are considerable, up to 20% in some cases, and the precise manoeuvrability means cost savings can be made by dispensing with the need for tugs in many ports. The fuel savings also reduce emission levels enhancing environmental performance. Azipod® units have a robust construction and achieved a remarkable availability level of 99.8% over 15 million operating hours. Today Azipod® units are fitted with highly sophisticated condition monitoring systems which help to increase service intervals and give an early indication if maintenance is required. Can you give some examples of cruise ships that use the ABB system? Azipod® propulsion units are the market leading solution for today’s modern large cruise ships. The world’s largest cruise ship, Symphony of the Seas, delivered to Royal Caribbean in April 2018, features Azipod® XO units, following their successful use onboard several earlier vessels for the company, including Quantum of the Seas, which was the first vessel to utilize the bigger size XO technology. Propulsion for the Aida Cruises sisters, AIDAperla and AIDAprima, delivered in 2017 and 2016 respectively, is also based around Azipod® systems. Norwegian Cruise Line has been a regular customer for ABB, and ships with the Azipod® technology include the Norwegian Breakaway and Norwegian Getaway. 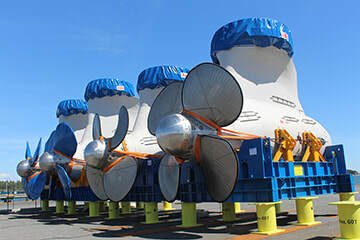 These sisters each have two 17.5 MW Azipod® XO propulsion units together with the Azipod® Dynamic Optimizing system to enhance steering and turning angles, leading to fuel savings and reduction in emissions. What do you see as the future of podded propulsion? ABB is heavily investing in product development and is using experience from already operating vessels in order to maintain the position as the leading supplier of azimuthing thrusters. *Other manufacturers make propulsion systems with azimuthing pods. However, only ABB makes the Azipod® system.